From a devotional address given at Brigham Young University on July 12, 2011. For the full text, visit speeches.byu.edu. How does Godʹs grace really work? Christ asks us to show faith in Him, repent, make and keep covenants, receive the Holy Ghost, and endure to the end. By complying, we are not paying the demands of justice﻿—not even the smallest part. Instead, we are showing appreciation for what Jesus Christ did by using it to live a life like His. Justice requires immediate perfection or a punishment when we fall short. Because Jesus took that punishment, He can offer us the chance for ultimate perfection (see Matthew 5:48; 3 Nephi 12:48) and help us reach that goal. He can forgive what justice never could, and He can turn to us now with His own set of requirements (see 3 Nephi 28:35). Christ’s arrangement with us is similar to a mom providing music lessons for her child. Mom pays the piano teacher. Because Mom pays the debt in full, she can turn to her child and ask for something. What is it? Practice! Does the child’s practice pay the piano teacher? No. 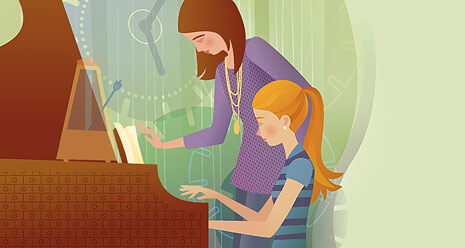 Does the child’s practice repay Mom for paying the piano teacher? No. Practicing is how the child shows appreciation for Mom’s incredible gift. It is how he takes advantage of the amazing opportunity Mom is giving him to live his life at a higher level. Mom’s joy is found not in getting repaid but in seeing her gift used﻿—seeing her child improve. And so she continues to call for practice, practice, practice. The miracle of the Atonement is not just that we can go home but that﻿—miraculously﻿—we can feel at home there. If Heavenly Father and His Son did not require faith and repentance, then there would be no desire to change. Think of your friends and family members who have chosen to live without faith and without repentance. They don’t want to change. They are not trying to abandon sin and become comfortable with God. Rather, they are trying to abandon God and become comfortable with sin. If the Father and the Son did not require covenants and bestow the gift of the Holy Ghost, then there would be no way to change. We would be left forever with only willpower, with no access to His power. If Heavenly Father and His Son did not require endurance to the end, then there would be no internalization of those changes over time. They would forever be surface and cosmetic rather than sinking inside us and becoming part of us﻿—part of who we are. Put simply, if Jesus didn’t require practice, then we would never become Saints. “But don’t you realize how hard it is to practice? I’m just not very good at the piano. I hit a lot of wrong notes. It takes me forever to get it right.” Now wait. Isn’t that all part of the learning process? When a young pianist hits a wrong note, we don’t say he is not worthy to keep practicing. We don’t expect him to be flawless. We just expect him to keep trying. Perfection may be his ultimate goal, but for now we can be content with progress in the right direction. Why is this perspective so easy to see in the context of learning piano but so hard to see in the context of learning heaven? The grace of Christ is sufficient (see Ether 12:27; D&C 17:8)﻿—sufficient to cover our debt, sufficient to transform us, and sufficient to help us as long as that transformation process takes. The Book of Mormon teaches us to rely solely on “the merits, and mercy, and grace of the Holy Messiah” (2 Nephi 2:8). As we do, we do not discover﻿—as some Christians believe﻿—that Christ requires nothing of us. Rather, we discover the reason He requires so much and the strength to do all He asks (see Philippians 4:13). Grace is not the absence of God’s high expectations. Grace is the presence of God’s power (see Luke 1:37). We are saved through the grace of Christ, who paid the price of our sins. Our works, such as repentance and keeping the commandments, do not save us, but they are requirements set by the Savior to help transform us. God’s grace is divine power to help us with all of our shortcomings and is available to us at all times.